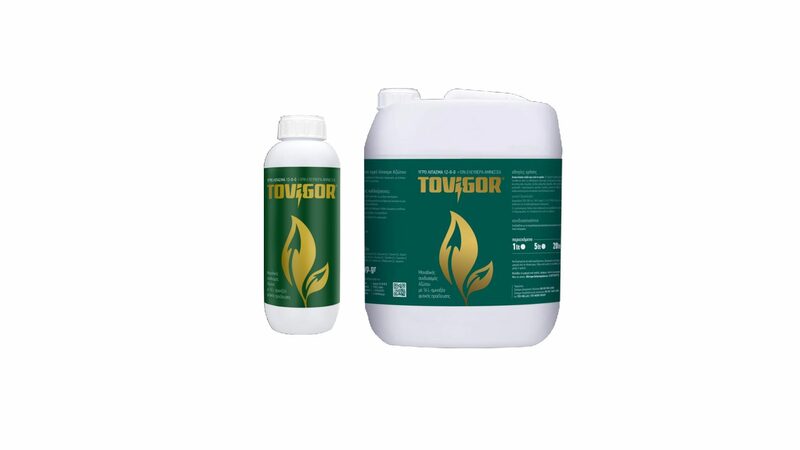 Tovigor is a liquid fertilizer with nitrogen and 16 L-amino acids of plant origin with a particularly stimulating effect on plant growth. It has a beneficial effect on the development of the root system, promotes nutrients rapidly and efficiently to all parts of the plant, quickly recovers plants from deficiencies or other adverse conditions, enhances fertilization, increases fruit set and helps efficiently to increase production. 300-500 ml / 100 lt water or 2-4 It / 1000 m2 with irrigation water in repeated applications. Can be combined with most plant protection products and foliar fertilisers. The recommended doses are indicative and vary depending on temperature, sunshine and soil pH. Store in a cool, dry and well ventilated place, away from heat sources, open flame or sunlight. Under these conditions and when kept in its original, sealed packaging, it remains stable for at least 2 years.